This problem set is intended to help you prepare for Exam 1. You may work on it by yourself or with other students, but you will need to do the exam on your own. You have only one week to complete this problem set. We recommend you start early and take advantage of the staffed lab hours. Get practice with some of the material that will be on Exam 1 including: recursive definitions, procedures, lists, and measuring work. Download: Download ps4.zip to your machine and unzip it into your home directory J:\cs150\ps4. ps4.ss — A template for your answers. You should do the problem set by editing this file. lorenz.ss — Some helpful definitions for this problem set. Cryptography means secret writing. The goal of much cryptography is for one person to send a message to another person over a channel that an adversary may be eavesdropping on without the eavesdropper understanding the message. We do this by having functions that encrypt and decrypt messages. The encrypt function takes a plaintext message and produces a ciphertext message. Encrypt scrambles and alters the letters of the plaintext message so that an eavesdropper will not be able to understand the message. The decrypt function takes a ciphertext message and produces the corresponding plaintext message. Encryption works as intended if the only person who can perform the decrypt function is the intended recipient of the message. Since making up good encrypt and decrypt functions and keeping them secret is hard, most cryptosystems are designed to be secure even if the encryption and decryption algorithms are revealed. The security relies on a key which is kept secret and known only to the sender and receiver. The key alters the encryption and decryption algorithm in some way that would be hard for someone who doesn't know the key to figure out. If the sender and receiver use the same secret key we call it a symmetric cipher. If the sender and receiver can use different keys we call it an asymmetric cipher. In this problem set, you will explore a symmetric cipher based on the Lorenz Cipher that was used by the German Army High Command to send some of the most important and secret messages during World War II. 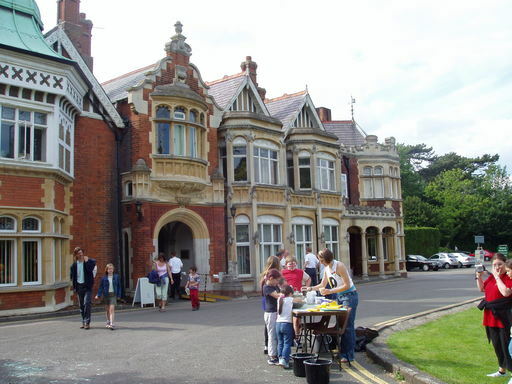 The Lorenz Cipher was broken by British Cryptographers at Bletchley Park. Arguably the first electronic programmable computer, Colossus, was designed and built by Tommy Flowers, a Post Office engineer working at Bletchley Park during the war. 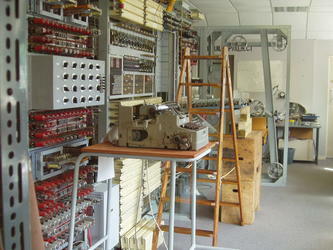 Ten Collosi were built in 1943 and 1944, and used to break some of the most important German messages during World War II. Messages broken by Colossus were crucial to the D-Day invasion since the allies were able to learn that their campaign to deceive Hitler about where the attack would come was succeeding and knew where German troops were positioned. Upper bound O ("big-oh"): f(x) is O (g (x)) means there is a positive constant c such that c * f(x) < g(x) for all but a finite number of x values. Lower bound Ω ("omega"): f(x) is Ω (g (x)) means there is a positive constant c such that c * f(x) > g(x) for all but a finite number of x values. Tight bound Θ ("theta"): f(x) is Θ (g (x)) means that f(x) is O(g (x)) and f(x) is Ω (g (x)). For each property that is true, select a c value and show why the necessary property holds for the selected c value for all but a finite number of possible n values. For each property that is false, explain why no such c value exists. One way to do this is to show how for any selected c value, you can find infinitely many n values that fail to satisfy the necessary property. n2 is O (n3) since if we pick c = 1 then c * n2 < n3 for all n > 1.
n2 is not Ω(n3 since for any c value we know c * n2 is not > n3 for all n > c. This is the case since c * n2 is less than n3 if c is less than n. For any finite value c, there are infinitely many n values greater than c that fail to satisfy the needed property. n2 is not Θ(n3 since n2 is not Ω(n3. Question 1: For each f and g pair below, argue convincingly whether or not f is (1) O(g), (2) Ω(g), and (3) Θ(g) as explained above. For all questions, assume n is a non-negative integer. The exclusive-or (xor, sometimes pronounced �zor�) function is one of the most useful functions for cryptography. The xor function evaluates to true if exactly one of the inputs is true. In the English language people often use �or� when they mean to say �xor� since English does not have a word meaning precisely xor. For example, take the statement �This Tuesday night we can work on our CS150 problem set or watch the exciting finale of "Big Brother 6".� Since only one can actually take place (assuming they occur at the same time), we should actually say xor. On the other hand, the statement �working on our CS150 problem set or watching the exciting finale of "Big Brother 6" is a worthwhile activity� is true if either one or both of these activities is worthwhile (and in the opinion of the CS150 staff, at least, that makes it a true statement). The statement, �working on our CS150 problem set xor watching the exciting finale of "Big Brother 6" is a worthwhile activity� is also likely to be true. In cryptography, it is usually easier to deal with 1 and 0 instead of true and false. For this problem set, use 1 to represent true and 0 to represent false. We will call each 0 or 1 a bit, since this is the smallest unit of information. Question 2: Define the xor function that takes two bits as parameters and evaluates to 1 if exactly one of the parameters is 1 and evaluates to 0 otherwise. invertibility � (xor (xor a b) b) always evaluates to a, no matter what b is. This means if we encrypt a message by xor-ing it with a key, we can decrypt the message by using xor again with the same key! perfect secrecy � if a is a message bit and r is a perfectly random bit (fifty percent chance it is true and fifty percent chance it is false), then (xor a r) is equally likely to be true or false regardless of the message bit a. The second property means that if a message is encrypted by converting the message into a sequence of bits, and xor-ing each bit in the message with a perfectly random, secret bit known only to the sender and receiver, then we can send a message with perfect secrecy! This is known as a one-time pad. Fortunately for the allies, the Nazis didn't have a way of generating and distributing perfectly random bit sequences. Instead, they generated non-random sequences of bits using rotors. 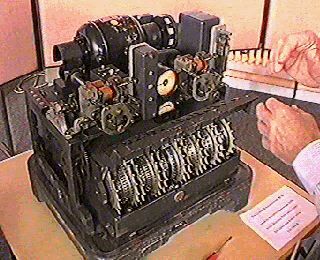 The Soviet Union also used a one-time pad cipher following WWII. Because their key bits were not truly random, and because they sometimes reused keys, the NSA was able to decrypt many important KGB messages. Details of this were released in 1995, and are available at the NSA's web site. We will look at how the Lorenz cipher used xor to encrypt messages soon. First, we consider how to turn messages into sequences of bits. (char-to-baudot c) � evaluates to the baudot code, represented as a list of five bits, corresponding to the character c.
(baudot-to-char code) � evaluates to the character associated with the Baudot code represented by the list of five bits passed as the code parameter. Characters are represented in MzScheme using #\character. For example, #\H is the character H and #\space is the space character. a. Write a function string-to-baudot that takes a string and transforms it into a list of Baudot codes. c. Describe the complexity of your baudot-to-string procedure using Θ notation. Make sure to explain carefully what any variable you use means. The Lorenz cipher was an encryption algorithm developed by the Germans during World War II. It was used primarily for communications between high commanders. The original Lorenz machine consisted of 12 wheels, each one having 23 to 61 unique positions. Each position of a wheel represented either a one or a zero. Our Lorenz machine will use 11 wheels, each with only 5 positions. The first five wheels will be the K wheels and the second five the S wheels. Each of these will only have a single starting position for all 5  that is, unlike the real Lorenz machine, for this problem set we will assume all five K wheels start in the same position and all five S wheels start in the same position. We have provided 3 lists that represent the wheels. The first is called K-wheels and is a list of lists, each of the inner lists containing the 5 settings. The definition is: (define K-wheels (list (list 1 1 0 1 0) (list 0 1 0 0 1) (list 1 0 0 1 0) (list 1 1 1 0 1) (list 1 0 0 0 1))). There is a similar list called S-wheels to represent the S wheels of our simulated machine. The final list represents the M wheels and is just a single list. The definition is (define M-wheel (list 0 0 1 0 1)). Question 4: To rotate our wheels, we will take the number at the front of the list and move it to the back. The first number in the list will represent the current position of the wheel. a. Define a function rotate-wheel that takes one of the wheels as a parameter. It should return the wheel rotated once. For example, (rotate-wheel (list 1 0 0 1 0)) should evaluate to (0 0 1 0 1). Although all the wheels in our simulated Lorenz cipher machine have five bits, your rotate-wheel procedure should work for any length list. b. Define a function rotate-wheel-by that takes a wheel as the first parameter and a number as the second. The function should return the wheel list rotated by the number passed in. For example, (rotate-wheel-by (list 1 0 0 1 0) 2) should evaluate to (0 1 0 1 0) and (rotate-wheel-by wheel 5) should evaluate to wheel. a. Define a function rotate-wheel-list that takes a list of wheels (like K-wheels) as a parameter and evaluates to a list of wheels where each of the wheels in the parameter list of wheels has rotated once. For example, (rotate-wheel-list K-wheels) should evaluate to ((1 0 1 0 1) (1 0 0 1 0) (0 0 1 0 1) (1 1 0 1 1) (0 0 0 1 1)). b. Define a function rotate-wheel-list-by that takes a list of wheels and a number as parameters, and evaluates to a list where each of the wheels in the parameter list of wheels has rotated the number parameter times. For example, (rotate-wheel-list-by K-wheels 5) should evaluate to the same list as K-wheels. c. Describe the complexity of your rotate-wheel-list-by procedure using Θ notation. Be sure to explain what all variables you use mean. Now that we can rotate our wheels, let's figure out how to implement Lorenz encryption using our K and S wheels. Since both sets of wheels are doing the same thing, we should be able to write one procedure that will work with either the K wheels or the S wheels. Question 6: Define a function wheel-encrypt that takes a Baudot-encoded letter (a list of 5 bits) and a list of wheels as parameters. The function should xor each bit of the Baudot list with the first value of its respective wheel and return the resulting list. For example, (wheel-encrypt (list 0 0 0 1 1) K-wheels) should produce (1 0 1 0 0). Your wheel-encrypt procedure should be Θ(n) where n is the length of the list passed as the first parameter to wheel-encrypt. Argue convincingly why your wheel-encrypt procedure is Θ(n). The S wheels are rotated one position only if the current position of the M wheel is 1.
a. Define a function called do-lorenz that takes a list of Baudot values, the K wheels, S wheels and M wheel. The function should encrypt the first Baudot code with the K and S wheels, then recursively encrypt the rest of the Baudot codes with the wheels rotated. The function should return the encrypted values in the form of a list of Baudot values. b. Define a function lorenz that takes four parameters: a string and three integers. The integers represent the starting positions of the three wheels, respectively. The function should call do-lorenz with the string converted to Baudot and the wheels rotated to the correct starting positions. The function should return the ciphertext in the form of a string. You should now be able to encrypt strings using the simplified Lorenz cipher. To test it, call your lorenz function with a string and offsets of your choice to produce ciphertext. Since our encryption and decryption functions are the same, if you evaluate lorenz again using the ciphertext and the same offsets you should get your original message back. Our simplified cipher will be much easier to break. Since there are only 5 starting positions for the K wheels, 5 for the S wheels, and 5 for the M wheel, there are only 125 different keys. This is such a small number that we can simply try every possibility and look at the results to find the original message. Breaking a cipher by trying all possible key values is called a brute-force attack. Question 8: Define a procedure that takes a ciphertext and evaluates lorenz on the ciphertext for all 125 possible starting positions. It may be helpful to use the function printf that will print out a string to the interactions window. If your procedure works correctly, one of the messages generated will look like sensible English. a. The actual Lorenz cipher operated similarly to the one in this problem set except instead of only having 5 positions in each wheel, each wheel had many more positions (up to 61). Suppose n is the number of possible positions for each Lorenz cipher wheel, and the procedure used to cryptanalyze the cipher is the same as your code (except extended as necessary to handle the extra wheel positions). Describe how the amount of work needed to break a Lorenz-encrypted message grows as a function of the number of wheel positions, n, using Θ notation. Assume the message length and number of wheels are fixed. b. Suppose instead that it was possible to add S and K wheels to the Lorenz cipher, and w represents the number of S and K wheels (for example, for the cipher machine in the problem set, w is 5). Describe how the amount of work needed to break a Lorenz-encrypted message grows as a function of w, using Θ notation. Assume the message length and number of wheel positions are fixed. 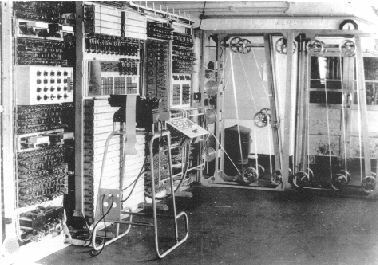 c. If the Nazis learned of Bletchley Park's success in breaking the Lorenz cipher during the war, what changes that could be done without building and redistributing completly new cipher machines, would be most likely to prevent further successful cryptanalysis? http://www.codesandciphers.org.uk/lorenz/  Tony Sale's Lorenz Ciphers and the Collosus. Tony Sale worked at Bletchley Park during WWII and founded the Bletchley Park Museum. He was also a consultant to the film Enigma. putting into cipher whatever might do injury if betrayed. Thomas Jefferson's instructions to Captain Lewis for the Expedition to the Pacific. It is regretted that it is not possible to give an adequate idea of the fascination of a Colossus at work: its sheer bulk and apparent complexity; the fantastic speed of thin paper tape round the glittering pulleys; the childish pleasure of not-not, span, print main heading and other gadgets; the wizardry of purely mechanical decoding letter by letter (one novice thought she was being hoaxed); the uncanny action of the typewriter in printing the correct scores without and beyond human aid; the stepping of display; periods of eager expectation culminating in the sudden appearance of the longed-for score; the strange rhythms characterizing every type of run; the stately break-in, the erratic short run, the regularity of wheel-breaking, the stolid rectangle interrupted by the wild leaps of the carriage-return, the frantic chatter of a motor run, the ludicrous frenzy of hosts of bogus scores. Credits: This problem set was created for CS200 Spring 2002 by Jon Erdman and David Evans, and tested by Stephen Liang. It was revised for CS200 Spring 2003 and CS150 Fall 2005 by David Evans.